“L. 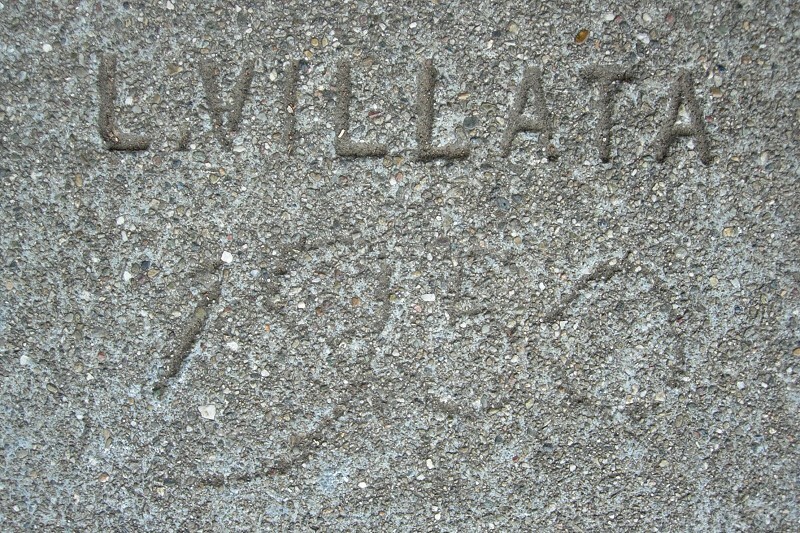 Villata” marks are found all over Oakland, but mostly in North Oakland. They’re all alike, except for a very few that were hand-inscribed with the date. I have documented dates from 1950 to 1953. Villata’s sidewalks are strong and well made, using a dark and slightly bluish concrete mix. Luigi Villata was born in Asti, Piemonte, Italy on 19 April 1890, but unlike many Italians who came to Oakland he waited until age 31, sailing from Le Havre in 1921. His older brother Stefano preceded him and was in business in Oakland as a cement worker, under the name Stephen, in the 1923 directory living at 454 42nd Street. Other family members in Oakland included brother Francesco “Frank” and half-brother Romolo. A sister, Bany, lived in San Francisco. Luigi became a U.S. citizen in 1929. Starting in the 1925 directory he referred to himself as Louis. At first he lived (and worked) with his brother Steve on 42nd Street, then moved to 617 47th Street in 1930 and to a bungalow at 5217 West Street in 1936, where he remained until at least 1958. It must be during this period that he used the “L. Villata” stamp. As of 1967, retired, he was living at 4408 View Street. His World War II draft record, from 1942, indicates that he was about 5 foot 6 and weighed 170 pounds, a typical Italian fireplug. At the time he was working for W. H. Wisheropp. Luigi married Luigia (Louise) Orecchia in 1925, and they had a son, Frank J., that year. She died in 1940 and is interred at Mountain View Cemetery. In 1944 he subsequently married his second wife Josephine (Maria Giuseppina) Piodelli, who died in 1957, and his third wife, Esther (Esterina) Brusasco, in 1958. Luigi passed on in 1976, and his son Frank died just a few years ago. This entry was posted on 5 October 2018 at 9:33 pm and is filed under Profiles. You can follow any responses to this entry through the RSS 2.0 feed. You can skip to the end and leave a response. Pinging is currently not allowed.